A two-day forum on the development of Tibet kicks off in Lhasa, August 12, 2014. 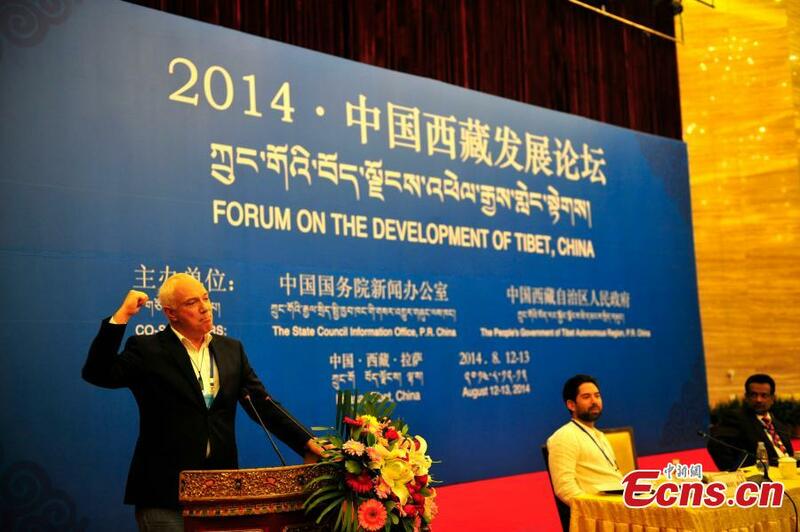 (TibetanReview.net, Aug13, 2014) –China has invited 40 supporters of its much-critiqued development policy on Tibet from other countries to a two-day forum in the occupied Himalayan region’s capital Lhasa beginning Aug 12. After delivering speeches praising and encouraging China on its current policy, the participants – said to include cheerleaders in the name of scholars, journalists, politicians and entrepreneurs from Britain, India, the United states and other countries – will enjoy field trip junkets in Lhasa and Nyingchi (Tibetan: Nyingtri) Prefecture, according to the country’s official Xinhua news agency Aug 12. Xinhua said the forum, with around 100 participants, was being sponsored jointly by the propaganda arm of the Chinese government, the Information Office of the State Council, along with the regional government of Tibet Autonomous Region, to gather opportunities and suggestions for the region’s future under Chinese rule. The report also cited Neil Davison, Labour’s shadow Advocate General sitting in the House of Lords, the British Parliament, as suggesting that China use forums like the ongoing one and “the power of media” to enable the people in his country to understand the type of development taking place in Tibet. Losang Jamcan, chairman of the Tibet regional government, has made the right noises about “never” developing the region at the expense of its environment, although the region has seen ever more protests, arrests, and persecutions of Tibetans for protesting against highly destructive Chinese mining works in their local areas in recent years. Xinhua said the ongoing forum, the fourth Forum on the Development of Tibet, was the first with so many overseas “representatives”. The previous forums were held in Vienna (Austria) on Nov 29, 2007; Rome (Italy) on Oct 22, 2009, and Athens (Greece) on Nov 10, 2011.